Quick search for Bucktown/ Wicker Park properties. Click the links below to search. Bucktown is a neighborhood filled with character and art. It lies just to the north of Wicker Park, between North and Fullerton avenues, and from the Kennedy Expressway (routes 90/94) west to Western. Once a neighborhood comprised of mostly Polish immigrants, Bucktown gets its name from the goats (called bucks) kept in the backyards of its early residents. The area's rejuvenation was started by local artists, once attracted by cheap rents and accessibility to the Loop and expressways. 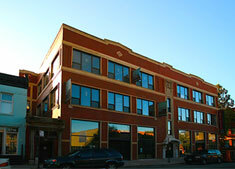 The central art district is bordered by Milwaukee, Damen, Wabansia and North avenues. There many galleries in and above store fronts and the historic Flat Iron Building houses galleries of many established and up-an-coming artists. This area is also the location of the annual Bucktown Arts Fest, every August, and the Around the Coyote art festival in September. Just about every corner hosts one of many neighborhood taverns. North and Damen avenues boast smoky late-night music clubs such as the famous Double-Door, and cosmopolitan clubs, boutiques, and restaurants. Bucktown also contains several remarkable churches, the legacy of early Polish immigrants. After many years of gentrification, the architecture is made up of once-humble cottages decked with skylights, converted lofts, new condos, brownstones, two- and three- flats, and the occasional elegant mansion. Wicker Park is a Chicago neighborhood northwest of the Loop, south of Bucktown. Charles and Joel Wicker purchased 80 acres (324,000 m²) of land along Milwaukee Avenue in 1870 and laid out a subdivision with a mix of lot sizes surrounding a four-acre (16,000 m²) park. The Great Chicago Fire of 1871 spurred the first wave of development, as homeless Chicagoans looked to build new houses. Wicker Park proved especially popular with German and Swedish merchants, who built large mansions along the neighborhood's choicest streets--particularly on Hoyne and Pierce, just southwest of North & Damen, known then as Robey. After World War II, Wicker Park became more ethnically diverse with an influx of Puerto Rican immigrants. Urban renewal projects were undertaken to combat "urban blight" in some parts of the neighborhood, but disinvestment continued at a rapid clip. Chicago and Wicker Park reached a nadir in the 1970s, a decade when the city overall lost 11% of its population; during the 1970s, hundreds of insurance arsons were reported in Wicker Park, and many small factories in the area (many in woodworking) closed or moved away. Efforts by community development groups to stabilize the community through new affordable-housing construction in the 1980s coincided with the arrival of artists attracted by the neighborhood's easy access to the Loop, cheap loft space in the abandoned factories, and distinctly urban feel. Today, the neighborhood is best known for its numerous commercial and entertainment establishments and being a convenient place to live for downtown workers due to its proximity to public transportation and the loop. Many new homes have been built as well as older homes being restored. This has led to increased business activity, with many new bars, restaurants, and stores opening to serve these individuals. 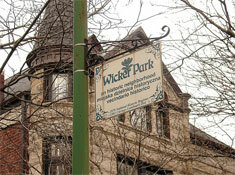 Much of Wicker Park was designated as a Chicago Landmark District in 1991.